Rajiv is an 11 year old boy. He is one of 3 boys in his family the youngest of whom is not even school aged. Sadly, the boys' mother has abandoned the family, and their father is in ill health. The family relies on handouts to survive. 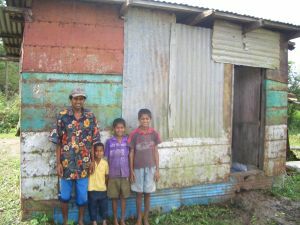 Rajiv's family home is a single room with no power, water, bathroom or kitchen facilities. As the eldest, Rajiv cooks outside for the whole family, and gets his brothers ready for school each day. This amazing story of survival, is even more so because of the huge smiles that this young boy is able to share. 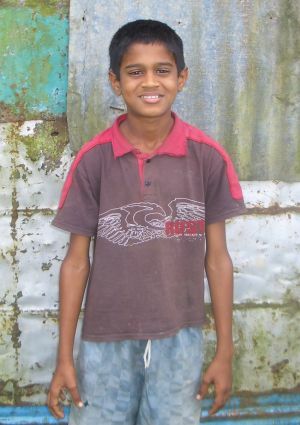 Rajiv enjoys attending school and his favourite subject is english. Rajiv travels to school each day on foot, walking around 1km each way. When he grows up, Rajiv wants to be a doctor. This little boy comes from a very poor family with his father struggling alone with the care of three little children.